Keeping up with updates, hotfixes, service packs can be very challenging and in some cases constant source of frustration for those managing it. Until we get to the point where it will all be managed automatically we need to rely on constantly monitoring what’s out there and what we have. Our own Autodesk Desktop App is a great tool that helped mitigate some of the concerns but it’s not always easy to track if having what you have it in fact what’s the latest. This post is meant to show what are some of the places to see available updates and installed updates. So let's concentrate on Civil 3D 2018 version. While there it’s good idea to check “Installed Updates”. This is where you can uninstall these from in case you need to. Third place to check is ABOUT dialog in the product. Once in the application run ABOUT command or pull it from help (question mark icon inside of Civil 3D) and you may see what is installed on your machine. Since Civil 3D is built on top of AutoCAD and Map 3D then those updates need to be installed, too. That is what you see those entries. Now that you established what you have installed it’s time to check what else is available (if anything). Best place to check is either Autodesk Desktop App or logging into accounts.autodesk.com and see what’s available out there. This will require a valid login. Without this you will not be able to get in. Autodesk Desktop App will take notice what you have installed on your machines and then compare to what’s available on Autodesk severs. The difference will be shown as available for updates. Once all of it is installed you may see “Your available updates are installed”. Otherwise you will see the list. Also, since we mentioned that AutoCAD is the platform for Civil 3D users have options to check what is available for AutoCAD, Map 3D, etc. Similarly, when you visit accounts.autodesk.com and search for your product you will be greeted by the list of all updates and hotfixes if you click on “Updates & Add-ons”. Why is this important? Besides liking to have the latest and greatest, when it comes to software sometimes order of install is important and there is a possibility to miss some important fixes as sometimes newer update include older updates and sometimes not. It’s best to check readme (readme articles are published online and users don't need to login to see the content of it) for all updates to see what’s included in there, what issues are being addressed, what functionality being added/changed or simply instructions how to install updates/hotfixes as some of them are executable and other time just files you need to replace. You get the point, right? For instance, Civil 3D 2018.1 is included in Civil 3D 2018.2 and having it reporting 2018.2 may hint that you have the latest update but that would mean Civil 3D 2018.0.1 is not there unless you read readme. I hope this didn't confuse you even more :) Stay tuned! Where are Civil 3D Country Kits? Not only that - but on the same site users can see some related content such as Productivity Tools for AutoCAD Civil 3D. So all you need to do is select your Country from the list below and get access to it. As always, check readme for information as such. What and Why of a "Clean Uninstall"
For my inaugural post in the Being Civil blog, I thought I'd return to my roots and write about the fundamentals. The following post is current, but would have been just as relevant 10 years ago. Why did I lie? Because I wanted the “magic quick-fix” that I’m sure someone at Autodesk was withholding from me. The reality is that, with rare exceptions, Autodesk support people have the same set of troubleshooting tools available to the public. What Is a Clean Uninstall? Most people are familiar with a traditional uninstall. You find the product in the Programs and Features area of Windows and click Uninstall. After a bit of chugging, the icons are gone from the desktop and the product no longer appears in the installed programs listing. Windows-based products rarely remove all traces of themselves. There are several reasons products leave components behind. Mainly, it is to retain any user-specific settings. When a user re-installs the product, their personal tweaks will still be there. Another reason programs leave stuff behind is to avoid accidentally disrupting other products. In the case of Autodesk products, you’ll find data left behind in multiple places (more on this later). Why do a clean uninstall? I did an experiment on a fresh Windows 7 machine. When Civil 3D 2018 installs with as few options turned on as possible, it installs 32,410 files, 2,738 folders and creates 56, 923 registry keys. Many of those pieces of the installation are also used by other Windows programs (for example, C++ runtime libraries and .NET framework). Windows updates or changes made by other products can change a file version or overwrite a setting. Most of the time, software can handle minor changes. However, it is difficult to predict when a change to one of the thousands of registry keys or files will result in bad behavior in an Autodesk product. It is also difficult to trace which files or keys is the culprit when things do go wrong. 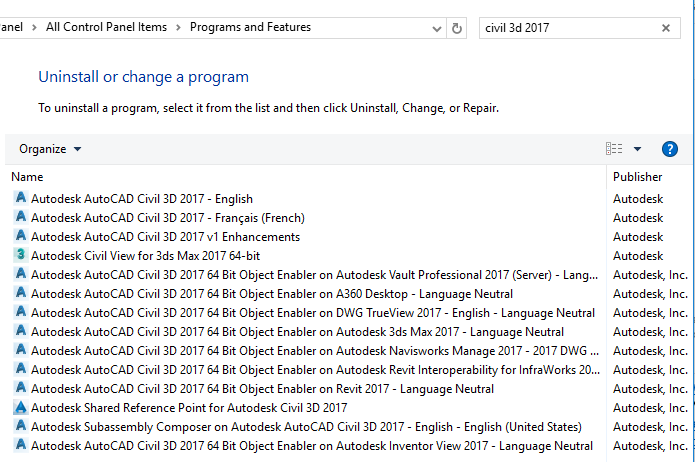 For these reasons, you may be asked by someone at Autodesk support to do a “clean uninstall” and reinstall of a product. When is it appropriate to do a clean uninstall? Before you jump head-first into a clean uninstall, take a moment to make sure this is the right option. Some problems cannot be solved by a clean uninstall and reinstall. For example, if your problem is graphic in nature (flickering, blurry, tiny text etc. ), it is unlikely that a re-install will help. If the problem seems to be specific to a file and other people are having the same problem, a reinstall is probably not the answer. Before committing to a re-install, be sure you have checked the usual suspects. Ask a co-worker to open a file and check if the issue is specific to your machine. A clean uninstall refers to using the regular uninstaller plus performing steps to ensure any bad files or registry entries are removed. The following example shows Civil 3D 2017. However, the steps are very similar for all Autodesk products running in Windows. Search “clean uninstall” on the Autodesk website for more details pertaining to other products and platforms. 2. Run the normal uninstalls from the Windows control panel Programs and Features area. This can end up being many items if you have multiple languages or add-ons. Uninstall all the items relating to the product you are trying to “clean” off the machine. These paths will vary per product. The exact registry values will vary per product. Check out JTB World's all-in-one list to find your products' numbers. Temporarily disable your antivirus program. Your IT department may push back on this. However, if you continue to have problems with a product, the antivirus may be blocking certain features from installing. The clean uninstall process can be tedious, but it will be faster to start with a clean slate than to hunt down which files or registry keys have gone haywire. One of the many upsides of cloud-based software is the lack of installed components. Cloud-heavy products, like Fusion 360 and InfraWorks have a smaller installed footprint since many of the calculations occur in the cloud. Autodesk's BIM 360 suite of products and AutoCAD 360 are delivered to you as a service through a web browser. The era has arrived where troubleshooting software starts with a browser refresh.